This isn’t strictly an internet based company, but one that markets a specific education technology that I have become very familiar with and which I think is quite appropriate for this critique. As you’ll see I am quite an enthusiastic supporter of using Vernier equipment so this may be slightly biased. Vernier sells and supports a wide range of electronic science equipment. Sensor probes are plugged into a portable computer unit called a LabQuest which processes and displays the data. Students can manipulate both the collection of data as well as analyze the data after it is recorded on an interactive touch screen. Public Schools, specifically middle and high school. Vernier’s primary offering is the LabQuest computer unit with an extensive and ever growing list of sensors that can be plugged into the LabQuest. (Examples of these sensors include motion sensors, temperature probes, pH meters, accelerometers, photo spectroscopes, and photo gates). Each sensor is sold separately and schools usually purchase at least one complete class set of both the LabQuest computer unit and the sensors they need. Vernier also provides new and innovative sensors every year in an attempt to keep up with what science and math teachers need. In addition to the hardware they sell the company also markets training and support services. Because the technology can initially seem quite daunting and may be confusing to the uninitiated, the training sessions are quite popular and can usually be arranged onsite at the school. If a school purchases an entire class set (~$450/each) they provide free support and training. For smaller purchases there are additional costs associated with it. In almost every case, the buyer is the school or school board. 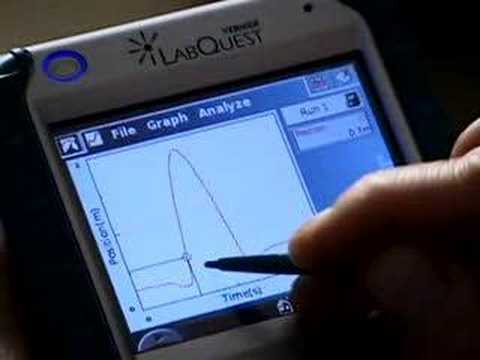 The LabQuest computers are relatively expensive at nearly $500 each so it becomes quite restrictive for a student to buy it themselves. Although the sensors that plug into the LabQuest are more affordable, the expense is generally not something that individual students, who will likely only use the LabQuest for one or two courses, want to deal with. Vernier markets their products and services around the world. I have personally used them in Asia and North America and received excellent product support in both places. The company has modified its software to suit the needs of the country it is operating in without difficulty. By using specialized adaptors, the hardware can be used in any area of the world and although software updates are available through the internet, it is not a requirement. The market in the developed world is particularly well suited to Vernier. As the student population becomes more comfortable and versatile using technology and as teachers learn more about the benefits of this technology, Vernier will likely experience significant growth in North America, Europe and parts of Asia. However, because of the expensive nature of the equipment, developing nations will be hard pressed to justify the expenses associated with this computer technology. Publicly funded education in developing countries will likely focus on the necessities of a proper science education like well trained science teachers with suitable lab environments before they begin to consider luxury science education items like the LabQuests. Exceptions to these policies will likely come from offshore private education institutions. However, as developing countries progress there will be a steady increase in the demand for Vernier equipment. Currently there are very few competing companies, the most notable being Pasco Equipment. As a result, there are few reputable and established alternatives for interested buyers. One consistent argument against Vernier equipment is that it does not sufficiently teach students proper lab skills or prepare them for real science because most of the data gathering is done by computer. While there is no arguing that nearly all the data is gathered by computers, assuming that real world science is not done on computers is a fallacy. Modern sciences (and many other related disciplines) embrace technology as a way to improve speed and productivity. Educators will have to follow this line both in terms of teaching methodology and as a content area. Students will need not only the most up to date learning techniques, but they also need to be prepared for the technology that awaits them in the real world. Vernier is a great company to CUBE. Thanks. In ETEC522 we seem to focus on Internet-based solutions, but there are lots of interesting technologies that aren’t web, or even digital. We are an equal opportunities outfit! Some Vernier probes are still on my purchase list, but with my recent Smartboard purchase, I think I’ll have to wait for next year’s budget. For a Physics 11 class, which ones would you recommend? Interesting that you mentioned Astronomy and technology Dave, because I had a similar experience just 10 days ago. I’m a budding amateur astronomer and I’m beginning to dabble in Astrophotography. My wife is somewhat interested and will usually come out with me every now and then; but when I tried to explain how my latest toy, Meade’s DSI III works, and that I didn’t actually look through the telescope itself or that I would ‘stack’ multiple images taken through different filters she said that it seemed sort of fake and not really ‘real’ astronomy anymore. As you pointed out though, that is probably closer to ‘real’ professional astronomy than gazing lazily through an eyepiece. Of course there are other ones, but those cover about 95% of the stuff I use (and use regularly). However, if you take a different approach to Physics or focus on different topics, you might use them differently. Regardless though, I’d consider the motion sensor, force sensor and accelerometer ‘standard’ Vernier equipment.